Following his opening 72 at Spyglass Hill, the tougher of the three Monterey Peninsula courses used for the first three days, the Dubliner had to settle for a one under 71 at Pebble Beach Golf Links as he ended his day tied for 56th on one under par. It left the world No 47 just a shot inside the projected cut mark after a couple of late short game errors turned what promised to be an excellent round into an ordinary one. The three-time major winner played solidly early on and kept his momentum going with solid par saves from four five feet at the second and four feet at the third before moving into top gear. He made his first birdie of the day at the uphill, par-five sixth, holing from 11 feet after a 30 yard bunker shot before holing a 10 footer at the iconic, 106-yard seventh to move into the upper echelons of the leaderboard. While he missed a great chance for birdie from just nine feet at the tough ninth, he wedged to 12 feet at the 11th to set up his third birdie of the day before moving swiftly into the top 20 thanks to a superb tee shot to 11 feet at the 213-yard 12th. The last six holes were a bit of a struggle, however, and Harrington bogeyed the 13th when he came up short of the green and chipped weakly to seven feet. Another shot went at the par-five 14th, where he was forced to lay up after a pulled tee shot and then missed the green left in the swale. Padraig Harrington during this pre-tournament chat with the mediaA poor pitch led to a dropped shot there and after a regulation par-four at the next, he three-putted the 16th by knocking his 40 footer six feet beyond the hole. Left with a ticklish, left to right return putt, he missed on the high side to drop back to one under for the day. Forced to chip and putt for his par three at the 17th, the 41-year old laid up in the right rough at the 18th and then overshot the green badly from just 118 yards. His short game saved him this time as he pitched back to four feet and knocked in the par putt but he will need to be sharper with his wedges in his third round at Monterey Peninsula if his is to shoot a low score and get back into contention. 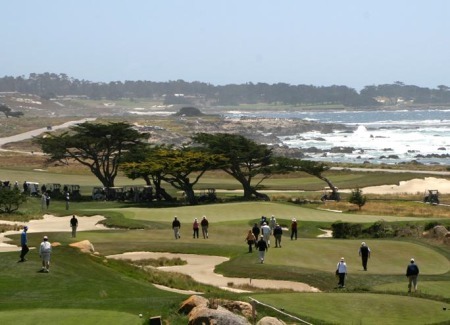 In the pro-am tournament, Harrington and JP McManus carded a five under 67 to be tied for 63rd on eight under with Marty Carr and Troy Kelly tied 63rd on eight under after a five under 65 at Monterey Peninsula. Dermot Desmond and Rafael Cabrera Bello are 134th on three over after a 74. Harrington is playing his fourth event of the season this week and will have played up to 10 events before the Masters following recently announced additions to his schudule. From Pebble Beach he will head to Los Angeles for the Northern Trust Open at Riviera and then to Tuscon for the WGC-Accenture Match Play. Set to skip the Honda Classic this year, he will return after a week’s break for the WGC-Cadillac Championship in Doral before heading straight from there to Asia for the OneAsia Tour’s Thailand Open alongside European Ryder Cup skipper Paul McGinley and the following week’s Maybank Malaysian Open on the European Tour. He then appears likely to skip the following week’s Shell Houston Open and play the Texas Valero Open in San Antonio as his warm up event for the following week’s Masters. Monterey Peninsula Country ClubPadraig Harrington finished the opening day atop the leaderboard in the AT&T Pebble Beach National Pro-Am. The only problem was that his name was alongside that of 14-handicap amateur partner JP McManus. 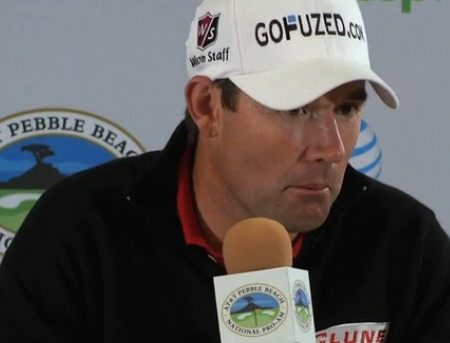 Pádraig Harrington hauled himself back onto the fringes of contention for the victory he needs in the AT&T Pebble Beach Pro-Am to qualify for the WGC-Accenture Match Play later this month.